Is Racism in Cape Town still evident? This is a question we often get asked by expats and foreigners who have to decide if Cape Town is the right place to raise their children and who want to get some insights from an 'outsider' living in Cape Town. We moved with our young children to South Africa ten years ago and have not regretted this decision once as we have learned so much about ourselves and others while living in the Mother City. Multiculturalism is alive in Cape Town. This is evident in daily life. 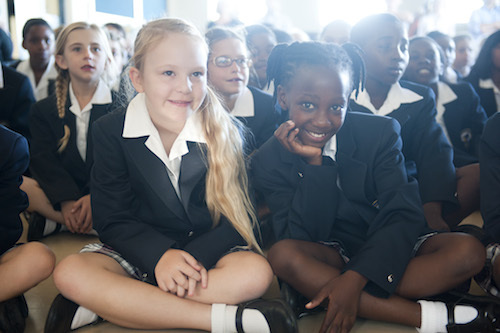 Mingling and mixing across the racial, cultural and social groups is certainly easier for the younger generations who have not experienced apartheid or who attend schools that cater for a diverse community. It is amazing to see how friendships between the different groups are encouraged through various activities at the local schools and education plays an important part in overcoming discrimination of all kinds. Transformation is taking place in South Africa, no doubt about this, but changes in society always take time. For many of the previously disadvantaged people living in Cape Town, this transformation process is too slow and racism is an issue which is often discussed. Racism is not a South African phenomenon. Racism in some form can be experienced by anybody almost anywhere in the world. In my experience, racism manifests in intolerance towards other people, in a lack of respect and a lack of understanding. Racism is a reaction caused by fear of the unknown, a reaction to a real or perceived disadvantage or a reaction to the experience of loss or uprootedness. This is a feeling, however, most expats can relate to very well. When settling in a new country, new culture, new surroundings, we experience this fear in culture shock and we also need to find ways to deal with this feeling. When we learn to cope with culture shock, we have to learn to practise tolerance and respect for strangers and strange situations. Tolerance and respect need to be practised from all population groups when we want to stop racism in South Africa. We have to learn to be aware of our own culture’s uniqueness but also learn to accept people of different racial and cultural backgrounds. We have to live in the here and now and not in the past to overcome this feeling of fear and unsettledness, otherwise the feeling of loss or disadvantage takes overhand and we do not advance during this change. Learning to be patient, respect and accept others is the most important lesson we learnt from our travels. When you are an outsider you learn to look at yourself, open up to others and accept differences. Throughout our journey, South Africans from all races and walks of life helped us to settle in this beautiful country. They welcomed us, they opened their hearts for us and shared their experiences with us. They taught us to become more tolerant and patient and see the light even in adverse situations. Cape Town is with Johannesburg the foremost expat destination in South Africa and an awesome place to live in and we admire the way South Africans approach life’s challenges and how much they care for each other. Expats from all over the world rank South Africa among best countries in the world for ‘integrating into the community’. South Africa ranks second for this experience, according to the latest expat survey taken by over 9,000 expats in over 100 countries in 2014. For raising expat children, South Africa ranks equally high. Expats living in South Africa state that their expat children have not only learned to be more outgoing while living in the country, but also that their children enjoy a wider cycle and greater diversity of friends. Racism has no place in Cape Town and not in any other part in this world. In South Africa, so many transforming and uplifting social projects are in operation and many expats living in the Mother City support these initiatives wholeheartedly. We see it as a privilege to witness and support them and to be part of this change! and share the news with your followers. You will know what we mean when you experience ‘multiracial and multicultural’ beach life on a weekend, take part in any social outreach program, spend time with your local colleagues and class mates, visit free concerts in the park where you will be able make new friends or when you mingle with the locals in the colourful Bo-Kaap. We will always cherish these memories of the wonderful vibrant atmosphere of the Mother City, where people embrace life and cherish diversity!